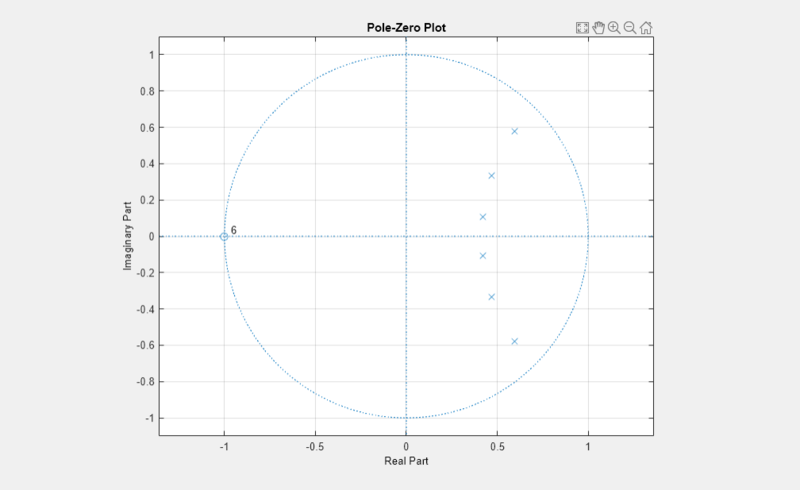 A filter is minimum phase when all the zeros of its transfer function are on or inside the unit circle, or the numerator is a scalar. An equivalent definition for a minimum phase filter is a causal and stable system with a causal and stable inverse. flag = isminphase(b,a) returns a logical output, flag, equal to true if the filter specified by numerator coefficients, b, and denominator coefficients, a, is a minimum phase filter. flag = isminphase(sos) returns true if the filter specified by second order sections matrix, sos, is minimum phase. sos is a K-by-6 matrix, where the number of sections, K, must be greater than or equal to 2. Each row of sos corresponds to the coefficients of a second order (biquad) filter. The ith row of the sos matrix corresponds to [bi(1) bi(2) bi(3) ai(1) ai(2) ai(3)]. flag = isminphase(d) returns true if the digital filter, d, has minimum phase. Use designfilt to generate d based on frequency-response specifications. flag = isminphase(...,tol) uses the tolerance, tol, to determine when two numbers are close enough to be considered equal. If not specified, tol, defaults to eps^(2/3). flag = isminphase(hs,...) determines whether the filter System object™ hs is minimum phase, returning 1 if true and 0 if false. You must have the DSP System Toolbox™ software to use this syntax. isminphase(hs,'Arithmetic',arithtype) analyzes the filter System object hs based on the specified arithtype. arithtype can be 'double', 'single', or 'fixed'. When you specify 'double' or 'single', the function performs double- or single-precision analysis. When you specify 'fixed' , the arithmetic changes depending on the setting of the CoefficientDataType property and whether the System object is locked or unlocked. You must have the DSP System Toolbox software to use this syntax. Unlocked 'Same as input' The function assumes that the coefficient data type is signed, 16 bit, and autoscaled. The function performs fixed-point analysis based on this assumption. Unlocked 'Custom' The function performs fixed-point analysis based on the setting of the CustomCoefficientsDataType property. Locked 'Same as input' When the input data type is 'double' or 'fixed', the function assumes that the coefficient data type is signed, 16-bit, and autoscaled. The function performs fixed-point analysis based on this assumption. Locked 'Custom' The function performs fixed-point analysis based on the setting of the CustomCoefficientsDataType property. When you do not specify the arithmetic for non-CIC structures, the function uses double-precision arithmetic if the filter System object is in an unlocked state. If the System object is locked, the function performs analysis based on the locked input data type. CIC structures only support fixed-point arithmetic. Design a sixth-order lowpass Butterworth IIR filter using second order sections. Specify a normalized 3-dB frequency of 0.15. Check if the filter has minimum phase. Redesign the filter using designfilt. Check that the zeros and poles of the transfer function are on or within the unit circle. Given a filter defined with a set of single-precision numerator and denominator coefficients, check if it has minimum phase for different tolerance values.